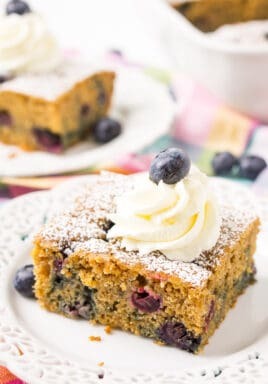 Overnight Breakfast Blueberry Cake is loaded with juicy blueberries, laced with vanilla, nutmeg, and cinnamon, and topped with brown sugar for a perfect finish. This recipe is slightly lightened up and a bit healthier than a traditional blueberry coffee cake recipe! I top it with a sprinkle of powdered sugar and a bit of whipped topping for a delicious dessert we all love! 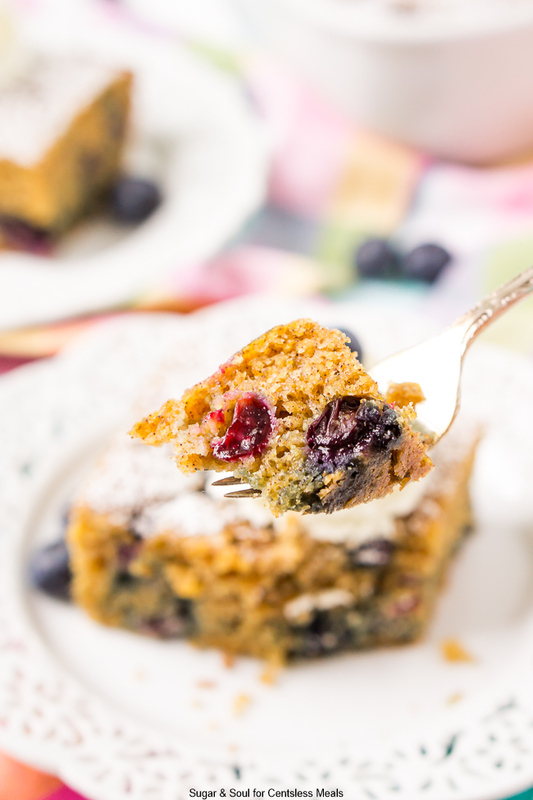 If you have a hard time getting breakfast together before you’ve had your morning coffee, this easy Blueberry Cake may be the perfect solution! A moist cake made with blueberries and spices make this recipe a crowd-pleaser, plus night-before prep makes for easy mornings. As you may have guessed, the batter for this Blueberry Cake has to sit in the refrigerator… well, overnight! Once the ingredients are assembled, they need to be chilled for 8 – 24 hours before baking. 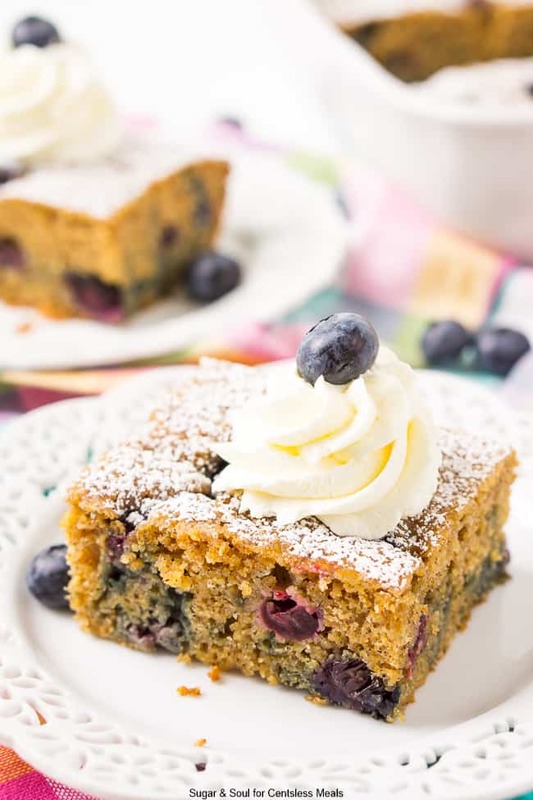 This scrumptious Blueberry Cake recipe is hearty and — dare I say — a lot healthier than other breakfast cake recipes! Ingredients like whole wheat flour, Greek yogurt, and applesauce give this breakfast treat a wholesome edge without sacrificing flavor. But don’t worry, there’s plenty of other yummy stuff in there, too. A mix of white and brown sugars mean this easy cake is deliciously sweet, plus warm spices like cinnamon and nutmeg make each bite extra comforting. Plus, who doesn’t love a cake filled with fat, juicy blueberries? I’d say it’s right up there with Blueberry Muffins. 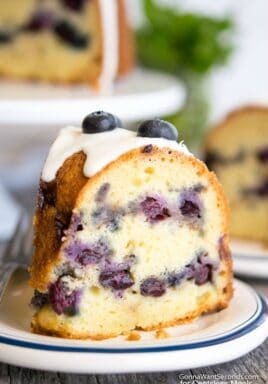 If you’re looking for a change from savory breakfasts (like Overnight Breakfast Enchiladas), try making this easy Blueberry Cake for Sunday morning breakfasts with the family. 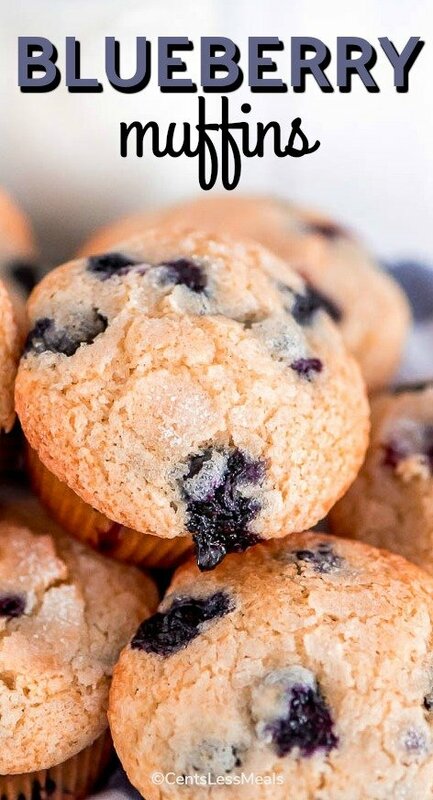 Since you mix up the batter the night before, all you have to do in the morning is top it with a few extra blueberries and brown sugar and pop it in the oven and sip your coffee until it’s baked! This recipe is also a great option to serve for brunch get-togethers and tastes wonderful when paired with orange juice, coffee, or mimosas. Plus, little hands-on time means you can spend more time preparing other dishes or mingling with your guests! If you’re lucky enough to have leftovers, these berry-filled slices make delicious and satiating afternoon snacks or grab-and-go breakfasts on busy Monday mornings. And if you have kids who are picky breakfast eaters (or they just can’t get themselves out of bed!) they can take a slice to-go as they head out the door. Maine, my home state, is famous for growing big, juicy blueberries, which we pick every summer. We always bring home a lot – which means some are used for family-favorite recipes, like this Blueberry Cake! 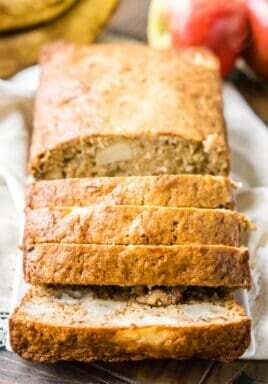 Needless to say, I’ll be savoring this wholesome cake recipe all summer long. How about you? 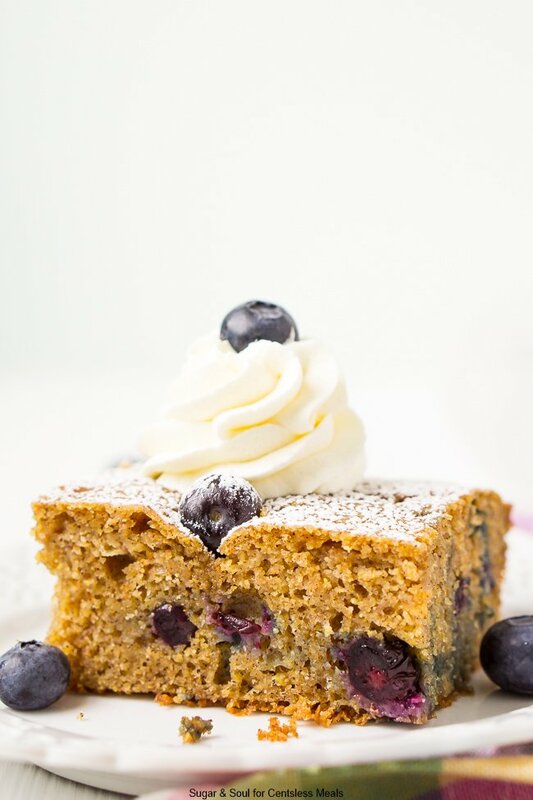 With a little advance preparation, Blueberry Cake lets you enjoy the best of both worlds: tasty breakfasts and long, lazy mornings! Try making this recipe for your loved ones, and enjoy spending less time in the kitchen and more time lounging in your PJ’s. But if you’re really in a baking mood, don’t forget to whip up a batch of my Toll House Cookie recipe! 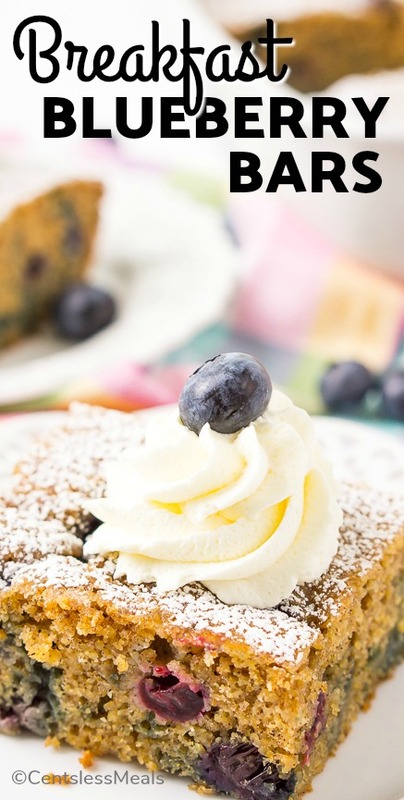 This Overnight Blueberry Cake is loaded with juicy blueberries, laced with vanilla, nutmeg, and cinnamon, and topped with brown sugar for a perfect finish. Spray a 9x13-inch pan with cooking spray and set aside. In a medium bowl, whisk together the flour, cornmeal, sugar, cinnamon, nutmeg, baking soda, and salt. In a large bowl or stand mixer fitted with a whisk attachment, gently beat the eggs. Add the yogurt, oil, applesauce and vanilla extract and beat together. Add the flour mixture to the wet ingredients and mix just until combined, pour half of the batter into the prepared baking pan. Layer half of the blueberries on top. Top with the remaining batter. Cover the pan with plastic wrap and chill in the fridge for 8 to 24 hours. Remove the pan from the fridge 30 minutes prior to baking. Preheat the oven to 350 degrees F and mix the remaining blueberries together with the brown sugar and spread over the top of the cake. Bake for 30 to 35 minutes or until toothpick comes clean from the center of the cake. Enjoy warm or at room temperature. Serve with whipped cream.